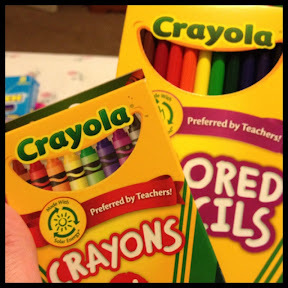 Regardless of how you felt about starting school again each fall - you looked forward to having a new box of crayons. There's something about the feeling of anticipation you get when you open up a new box of crayons. School starts in the next two weeks for most of the kidlets in my life (and for my teacher pals). Even amid the groans that come with the waining summer, there's an excitement in the air. Teachers are anticipating the new learning adventures around the corner. Students (ok, mainly the kindergarteners in my world) are looking forward to what's ahead at "big kid" school. My prayer for the kidlets and teachers - and for everyone in fact, is that you open up a new "box of crayons" either literally or figuratively this fall and discover the new beginning or fresh start God has in store for you. Who knows. Maybe you'll create something new and lovely - and unexpected & God will use that idea to touch someone's life in an amazing way. So here's to new beginnings and crayons - may we always have an abundance of both!